Struggling To Find The Right Gift To Say Thank You To Your Customers And Staff? Solve Your Christmas Gift Headaches In Two Minutes... Or Less! You want something a bit different from the standard fayre that everyone else gives. You can't get personalised gifts like these anywhere else. Something that the recipient will really enjoy (so they have a nice warm feeling when they think about your company). Everyone loves retro sweets... and isn't Christmas all about nostalgia and memories? A personalised gift is always good... but you think it's probably too late now to organise that in time for Christmas. Not for us... we'll dispatch your order to you in a day or two at most. And there either large minimum order quantities for personalised gifts or you end up paying through the nose just because you don't need a gazillion gifts. We have no minimum order at all. And if you want just one it won't cost you a penny extra!. 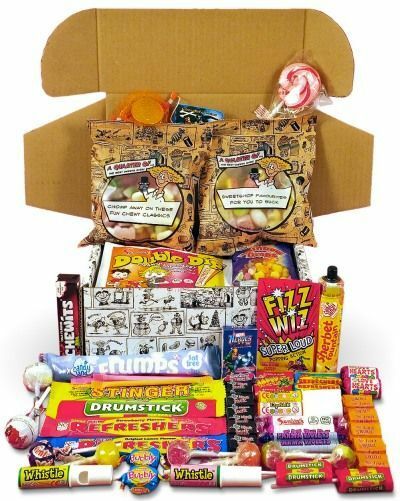 It's the top rated box of sweets on the whole of Amazon.co.uk with an incredible 1,110 FIVE STAR ratings. It's full to bursting with pick and mix classics like shrimps, cola bottles, fried eggs, milk bottles... and loads more. And that's it... you're done! Unless, that is, you want to include a photo too... (it's a doddle to upload and position that wherever you like). And what you see on the screen is EXACTLY what you get... on a luxurious glossy, high quality, personalised label.